PLEASE NOTE: If you come to visit Peach Creek during (or soon after) heavy or prolonged rains, the recommended route is via Peach Creek Cutoff Road. Heading north toward College Station on SH 6, stay on the freeway to the next exit AFTER the Peach Creek Road exit (Texas World Speedway exit). 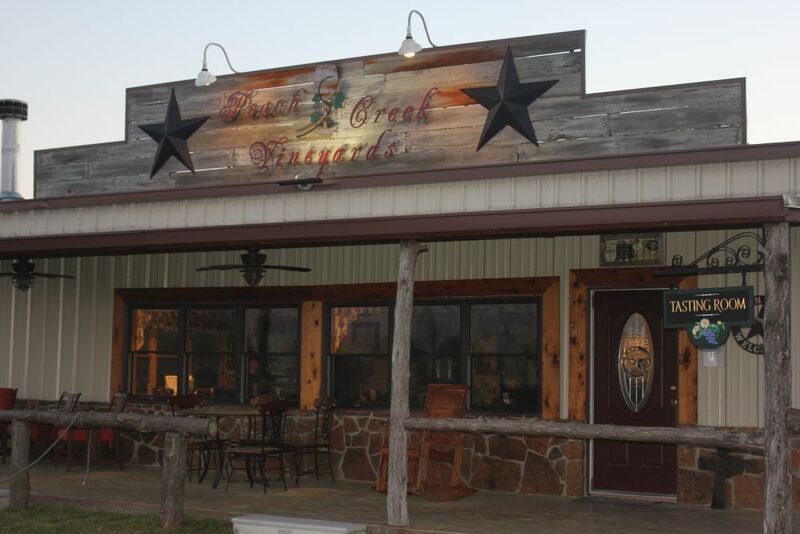 When you exit, you will be on the feeder road headed north; after passing the Flea Market, watch for the blue directional sign to Peach Creek Vineyards, and then turn right just past the sign on Peach Creek Cutoff Road. This road will dead end at Peach Creek Road, where you will see a “Winery” sign with an arrow; turn left and go about 1/2 mile, then turn left at 2029 Peach Creek Road (watch for the gold and maroon winery flag signs). If you pass the community center (on your right), you will have just missed the entrance. Drive through the gate, on past the vineyards, and park in the paved area in front of the tasting room. Go south from College Station on SH 6 and take the World Speedway exit (the next exit after Nantucket). Stay on the feeder road for about 1-1/2 miles. After Santa’s Wonderland, take the first U-turn under SH 6 so that you are heading back north on the feeder road. After passing the Jockey Lot Flea Market, watch for the blue directional sign to Peach Creek Vineyards and turn right on Peach Creek Cutoff Road. This road will dead end at Peach Creek Road where you will see a “Winery” sign with an arrow; turn left and go about 1/2 mile, then turn left at 2029 Peach Creek Road (watch for the gold and maroon winery flag signs). If you pass the community center (on your right), you will have just missed the entrance. Drive through the gate, on past the vineyards, and park in the paved area in front of the tasting room. Going east on Willam D. Fitch from SH 6 toward SH 30, turn right (south) onto Rock Prairie Road at the stop sign. This road turns into Peach Creek Road; when you reach a slight “Y” in the road, stay to the right and you will be on Peach Creek Road (a left turn there leads to Sulphur Springs Road). The entrance to the winery is almost exactly 5 miles from William D. Fitch. As soon as you pass the Peach Creek Community Center building on the left, take the next right at 2029 Peach Creek Road onto Stolpman Lane, between the gold and maroon winery flag signs. Drive through the gate, on past the vineyards, and park in the paved area in front of the tasting room. Traveling north on SH 6 toward College Station, take the Peach Creek Road/FM 159/Millican exit. Turn right at the stop sign onto Peach Creek Road. Drive about 2 miles and then turn left at 2029 Peach Creek Road onto Stolpman Lane between the gold and maroon winery flag signs. If you pass the community center (on your right), you will have just missed the entrance. Drive through the gate, on past the vineyards, and park in the paved area in front of the tasting room.